The family passion for rocks turned a hobby into a full time business when John and Terry decided to open a store utilizing the family’s extensive rock collection and John’s jewelry making skills. This combination served Tehama County until 1993, when Bill came on board and really shook things up. Four years later, the business remodeled, adding an 800 square foot mineral and mining museum and additional retail and manufacturing space. Gaumer’s Mineral and Mining Museum features fifty years and four generations of collecting. 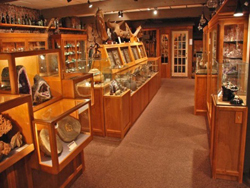 Beautiful, rare gem and minerals specimens from around the world , stone carvings, fossils, Native American artifacts, a fluorescent mineral display, and a detailed replica of an old mine tunnel complete with ore car, tracks and mining equipment. The free museum is open to the public during normal business hours; group tours are available for schools and special interest groups.